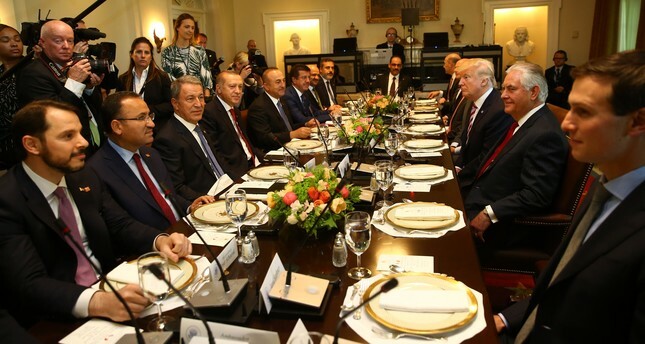 Presidents Recep Tayyip Erdoğan, Donald Trump and their delegations prepare to have lunch in the Cabinet Room of the White House in Washington, May 16. President Recep Tayyip Erdoğan and U.S. President Donald Trump's meeting at the White House on Tuesday was followed with great curiosity in Turkey and the region. The fact that the meeting was the first contact between Erdoğan and Trump, who only recently took the presidential office was striking on its own. In fact, the extent of relations Trump will establish with Turkey, which is located in a region where the heart of the U.S.'s internal policy beats, is crucial for regional balances. Therefore, Russia, Iran, Saudi Arabia, Syria and even India, which Erdoğan visited before the U.S., as well as China, the main rival of the U.S., eyed this visit. I think it goes without saying that EU countries, which are experiencing difficult membership negotiations with Turkey, the PKK and the Democratic Union Party (PYD) terrorists, who receive arms from the U.S., also had their eyes on the visit. Well, did the meeting fulfill expectations? Of course, the answer to this question will become clear in the coming days. However, it is obvious that consensus will not be a miracle, as Turkey's expectations from the U.S., its ally of half a century, are not a big deal. 1. The U.S. should not support the PYD and the People's Protection Units (YPG), the Syrian wings of the outlawed PKK, the upper structure of which the U.S. recognizes as a terrorist organization. 2. The U.S. should not harbor Gülenist Terror Group (FETÖ) leader Fetullah Gülen and the group's senior staff who are the perpetrators of the July 15 coup attempt in Turkey. Trump's messages in response to Erdoğan's emphases were extremely positive. I define them as extremely positive because Trump is as moderate and sincere as possible despite the domestic alliance that imposes the Barack Obama period's harming policies on him. Trump's message is that he understands Turkey's concerns, saying that he supports Turkey in its struggle against terrorist groups, such as the PKK and Daesh, and provides assurance regarding not leaving a safe area to terrorist groups. He also affirmed that deep-rooted cooperation and alliance between the two countries is indispensable for the U.S.
Of course, the summit consisted not only of talks that lasted for one hour and 10 minutes between the two leaders at the White House and the following official statements. Also, great progress was made via political acclimatization studies conducted by a high-level Turkish delegation that traveled to the U.S. days before Erdoğan's visit. In any case, however, it was a major development that Trump and Erdoğan, whose charismatic aspects dominated, met face to face in the meeting in an extremely positive atmosphere. The two leaders, who are developing a dialogue, measured and recognized each other with sincere gestures, which will inevitably bring responsibilities to both parties in the upcoming period. I think we can already say that the Turkish president and the U.S. president, whose people have the same enemy, have made a good start.